What kinds of things are we doing to prevent climate change? How many ALSO seem to be good ideas for many OTHER reasons other than avoiding catastrophic climate change? Above is a rally speech I gave on the topic to a crowd on a windy day in Asheville, North Carolina. Beth Sawin, my colleague and program co-director here at Sustainability Institute, inspired the theme through a series of blog posts on this topic. Read them here and here. Peter Senge too. 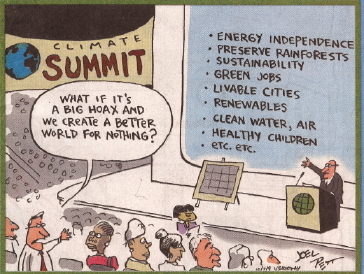 And Colin Beavan (“No Impact Man”) has what I think is the definitive list of secondary benefits of vigorous climate mitigation. Read it here. Thanks to John Sterman for pointing this out.